allows simultaneous use of both voice control and spellchecker. choose among 3 preinstalled voices (1 Italian female, 1 Italian male, 1 English). Three more voices are available and can be purchased to extend the program: the French, the Spanish and the German voices. 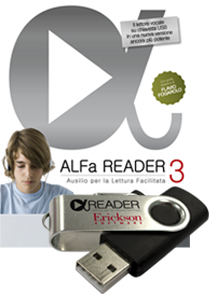 ALFa READER 3 is one of the compensatory instruments used by the pupil with Specific Learning Disorders, both at home and at school during tests (according to Law n. 170/2010), for all levels of education. A teaching guide, written by prof. Flavio Fogarolo, is provided with the software, which analyzes the potential of the synthesizer voice as a mean for compensating reading and writing disturbs, in order to promote thei ndependence and effectiveness of everyone’s study method. The guide also provides a variety of methodological indications and didactic suggestions to help you make the best use of the potential of ALFa READER 3.
in addition to controlling the speed of reading, it allows you to choose between continuous reading (the reading stops only on command or at the end of the page) or for individual sentences (the reading stops at the end of every sentence). it can provide up to 5-foreign-language voices (Italian, English, French, German and Spanish), similar to human voices, with a correct prosody and pleasant to listen to. The best technological solution to effectively compensate reading and writing difficulties. allows the simultaneous use of both voice control and spellchecker. choose among 3 preinstalled voices (1 Italian female, 1 Italian male, 1 English). Three more voices (French, Spanish and German) are available and can be purchased to extend the program. This software is already available and purchasable in the French, Spanish and German editions.